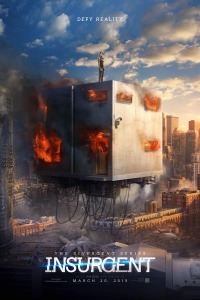 Watch the first The Divergent Series: Insurgent teaser trailer released on November 12, 2014. Today the first Insurgent teaser trailer was released for the upcoming second film in The Divergent Series. As many of us watched we were on pins and needles. Watching Tris (Shailene Woodley) masterly “defy reality” and gravity all in the attempts to save her mother, Natalie (Ashley Judd) was spectacular to see. The second installment of this four part film series will be directed by Robert Schwentke. In The Divergent Series: Insurgent we will see Tris along with Four (Theo James) navigate their way through allies, friends, and enemies while they are on the run from Erudite leader Jeanine (Kate Winslet). With the release of the film posters and now this teaser trailer I have truly believe we will receive another wonderful film adaptation of Veronica Roth’s Insurgent. Check out the Insurgent teaser trailer below and see why so many of us love Tris. Make sure to keep abreast to all things Insurgent by checking with us on our site, as well as following @Divergent on Twitter, checking the series Facebook site, the official The Divergent Series website, and following ‘DivergentSeries’ on Snapchat. The Divergent Series: Insurgent will be in in 2D, real3D, and Digital 3D on March 20, 2015.